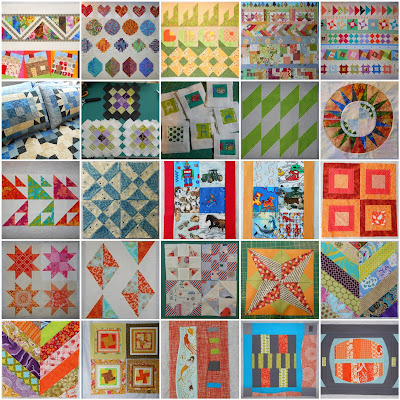 2012 Completed Quilts, a photo by capitolaquilter on Flickr. Tally is 13 finished completely for the year. 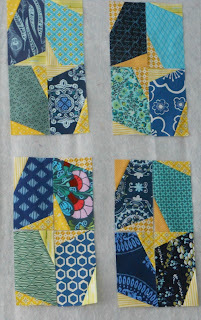 The next mosaic is of 9 tops that are ready to be quilted so I can start 2013 with an early finish or two. Pressing on with Madrona Road, a photo by capitolaquilter on Flickr. Is it about the journey or destination? 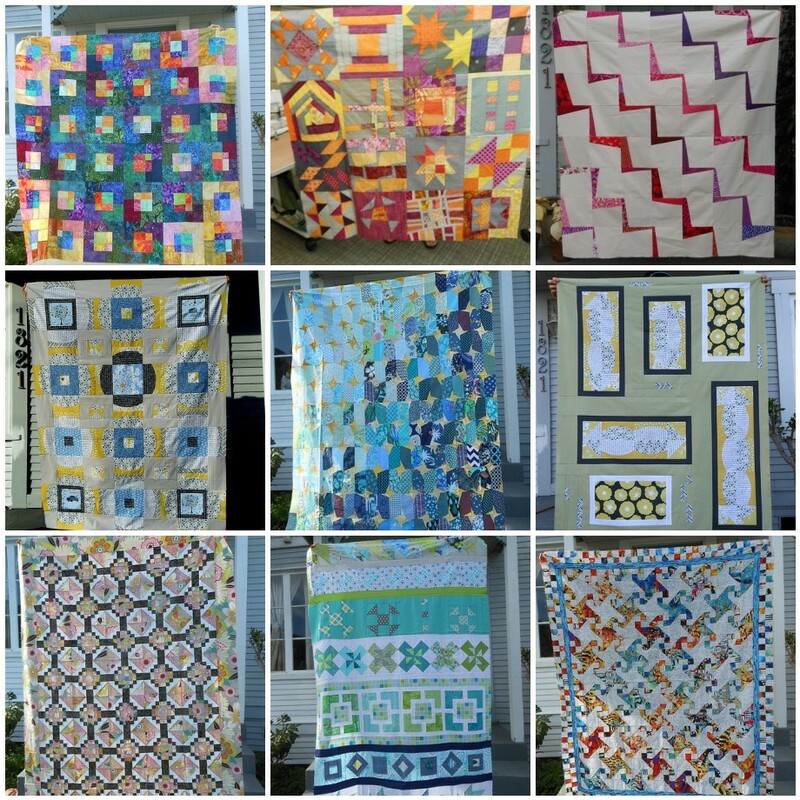 When it comes to quilting for me it is often both. With my Madrona Road the path has been a curvy one and quite bumpy at that thanks to the indecisive driver that I am. I've been sketching and tossing concepts around ever since I heard about the MQG Challenge. 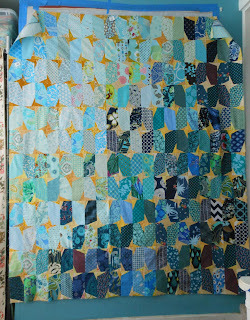 After the quilt is finished - and it will be - I'll post more about where I thought I was headed and where I ended up: two very different places. 2012 Bee Blocks, a photo by capitolaquilter on Flickr. I really do love my swap groups and creating for others. Mosaic maxed out at 36 so they aren't all here but most are....hope everyone that I have sent to has enjoyed their block. There were other blocks, rows and swaps that aren't included so my plan is to create I created another mosaic for those. The final will be of my finished quilts but I've got a few hours left before the clock strikes and I'm sewing like a wild woman! 2012 Finishes, a photo by capitolaquilter on Flickr. Misc Projects: Thanks to Zakka Sew Along and Ruby Star Wrap Along I was able to create much more in the "other than quilts" category for 2012. You would think that I would have learned to organize better since last year but no. Some are missing, some may be from 2011... my mosaic making is kind of like my quilting, close enough! Take Out Boxes, a photo by capitolaquilter on Flickr. 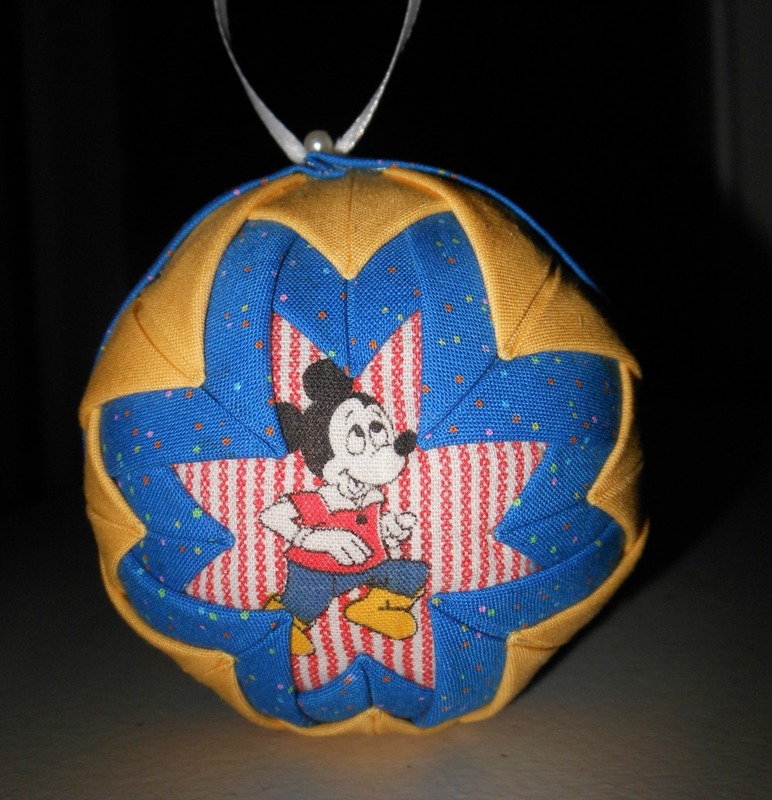 A ball shaped gift is about as awkward as you can get when it comes to packaging. My son made several ornaments for his friends and when it came time to wrap them the Chinese Take Out Boxes from Ruby Star Wrapping were a perfect solution. He had seen the one I had made early November as part of the Wrap Along and decided to make his own. We used Pellon fusible interfacing and he chose a variety of non-Christmas fabric so that they could be repurposed all year long tailoring the choices to the personality or interest of each person. Rather than using a hot glue gun, the bottoms were secured with Tacky glue and contrasting fabric strips were used to tie them closed. With the rush of the Holidays pictures of all of them weren't taken but I'm glad we could share a couple. 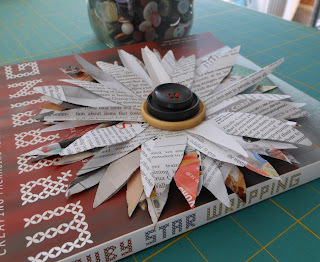 Linking up to the Sew Mama Sew Ruby Star Wrapping contest. Needless to say... everyone loved their gifts and the boxes they came in. 2012 Christmas Tree, a photo by capitolaquilter on Flickr. 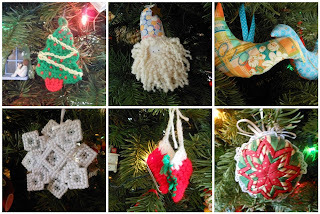 The handmade tree skirt and stockings that I have high hopes of making may have to wait until next year but I do have a few ornaments on the tree from years past to share. They were all made and given to us from family, friends and the quilty one is from my son's teacher about 12 years ago. 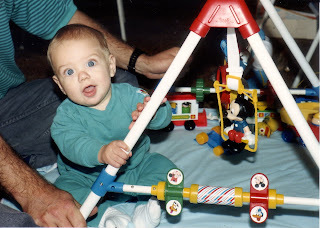 Little did I know at the time how appropriate it would be for me. Last night I finished up a couple of gifts and will share them AFTER they are given. It was the perfect way to spend a Flash Flood Warning kind of evening and we even ordered Pizza delivery which we never do! Hope you are all enjoying Christmas Eve and able to stay off the roads and out of the malls. If you've been following along with Ruby Star Wrap Along or if you were lucky enough to have attended Fall Market you may not be so confused by the newest addition to my Quilting Room decorations. I know that when I opened the box and I unwrapped the old cans and a toy my hubby sure needed an explanation. 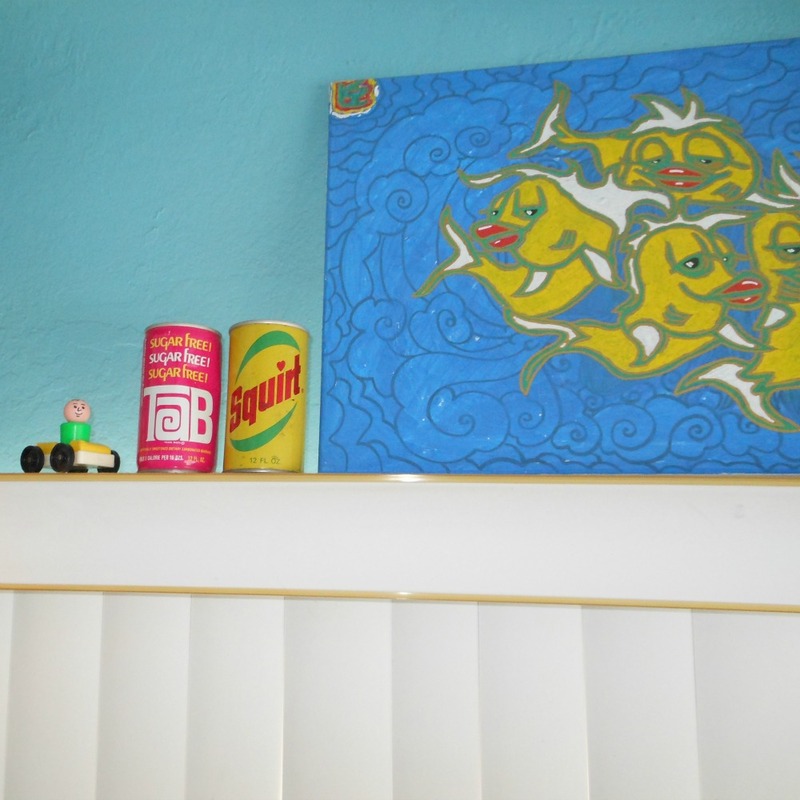 But first: don't they look perfect next to the painting my son gave me? And wouldn't those koi translate into awesome fabric? Here he is when he was a baby twenty-some years ago playing with a similar toy (on the blanket near his elbow). Here's the deal, they came along with the super fun Ruby Star Sparkle fabric bundle from the amazing Melody Miller herself. 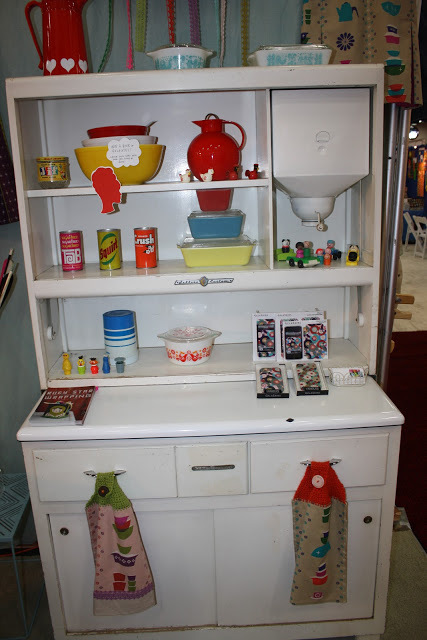 Sara of Sew Sweetness was so sweet to give me permission to share these pictures from her blog post where you can read an in depth interview and see lots more pictures from the nostalgic packed booth at market- be sure to check it out. Having grown up near the Roller Palladium the skates touch a sentimental cord - anyone else have a vivid childhood memory of trying to get in and out of the bathroom stalls while on wheels? Doing the hokey pokey, the limbo - my sister and I had our birthday party there around elementary age and we had birthday parties there for our boys when they were that old too. Of course they raced around on blades but I kept it old school along with most of the parents - who had about as much fun as I recall. I'm going to miss this little hop around. 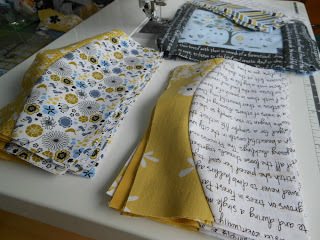 Small, adorable upcycles and little goodies to give friends was just what I needed to take the sting out of the occasional overwhelmingness of creating quilts. Don't get me wrong - I love the process but sometimes the many..many.. steps involved and countless hours until the finish line can be a bit much. Immediate gratification has it's place. Whipping out an entire project in an afternoon feels so rewarding. And what better time of year when spare time is rare and gift giving is at a prime? Perfect. Did you see the big flower in the front and the stem that appears to continue on so nicely? It may not be as impressive as lined up legs but still I was pretty pleased. Having to cover up the little red bouquet with the velcro on the inside on the other hand was a shame. I also wished I had cream velcro in my stash to blend better. Hope to see you linking up in the last week of the Ruby Wrap Along series. 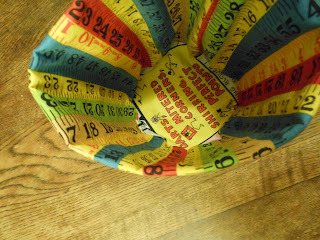 There are several items that I didn't get to - like the casserole carrier for my mom and her many potlucks or the Elephant pillow using Oakland A's fabric for my hubby a faithful fan... maybe in the New Year! Linking up to Really Random Thursday at Live a Colorful Life because it just doesn't get much more obscure than vintage soda cans and a post about bathroom stalls in my book. Here are several quilt inspiration photos and I've been pulling from my iPhoto library. My new mini has forced me to try and organize images, talk about a nostalgic chore! 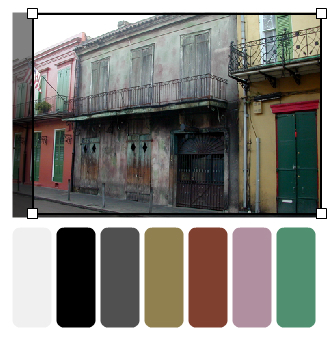 The second photo seemed too monochromatic to bother with a Color Palette but now I'm thinking that might be kind of interesting to see what comes up. 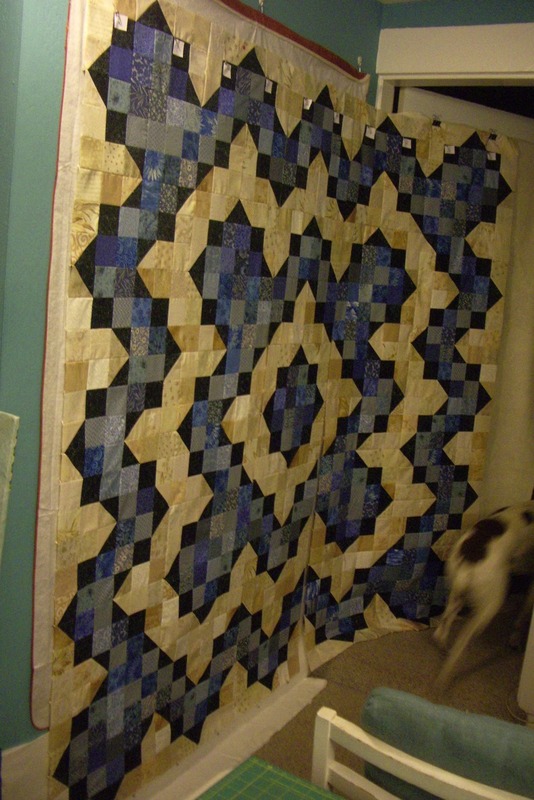 The Tassels Quilt top is now officially a top - for the second time. The awkward long and narrow proportions (seen here) are gone and the final size of 62x74 is just right. I took the bottom two rows off and picked the blocks apart. 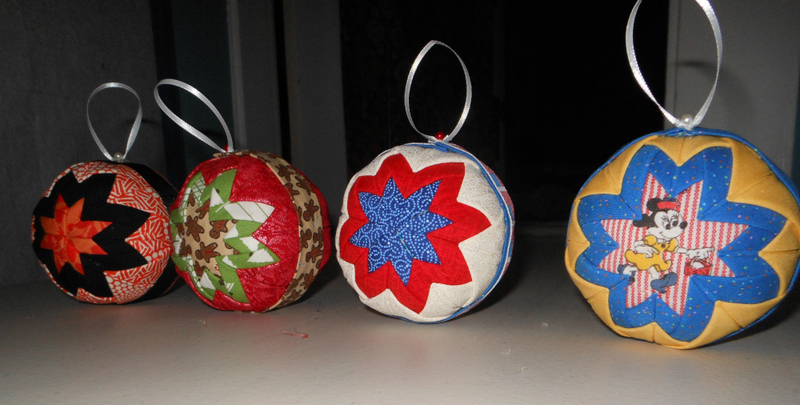 Made several more with the lovely fabric from my friends at the MQG Retreat and attached them to the right-hand side. Major improvement on my Luminosity top with the addition of a dozen new light blocks and a few more dark. I unstitched the bottom row of darks (originally a 4x5 layout seen here) to create a square vs rectangle and used them on the sides instead. The partial seam used in the construction of these blocks are really no big deal at all and I was kind of scared of them, silly. Here is the post about the Workshop I attended in September. 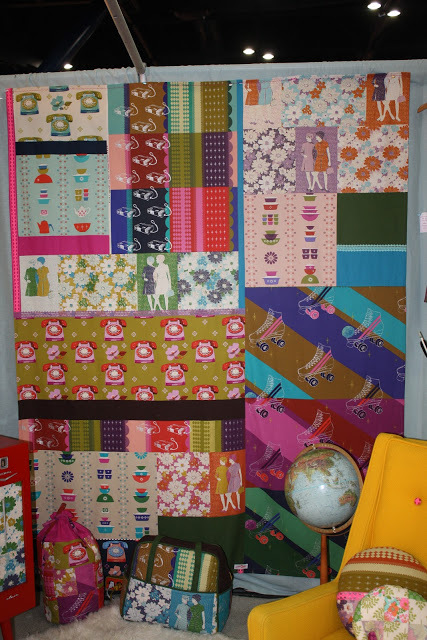 The layout was a bit challenging because I really needed to get a full view and my design wall is too small. The design door trick worked out marvelously (seen used for the first time below). The top is 74x74 and so I've decided rather than add a scrappy light border to make the dark float I'll just bind in light and hope that does the trick. I'm planning on entering both of these in the Quilt Show and the deadline is just weeks away so they were bumped to the top of the to do pile. 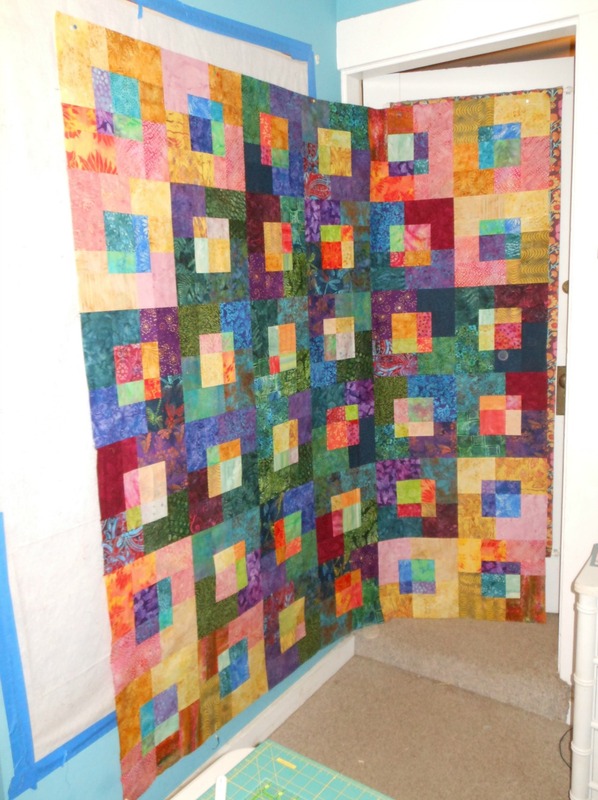 These two quilts are also the final of 4 project on my 4th quarter goal mosaic for FAL2012. 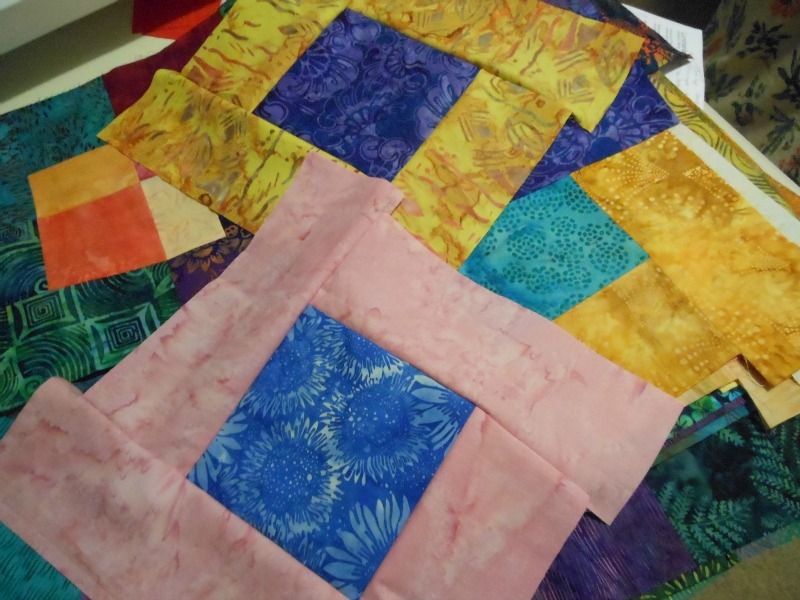 Two quilts completed but no photo shoot yet to prove it so you'll have to take my word for it. 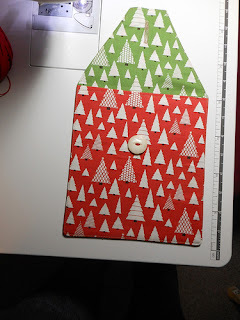 It feels like forever since I linked up to WIP Wednesday at Freshly Pieced. 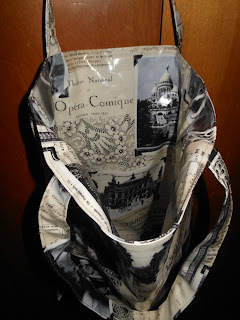 Today I made a reversible tote using the tutorial from skip to my lou and for the very first time braved working with laminate. 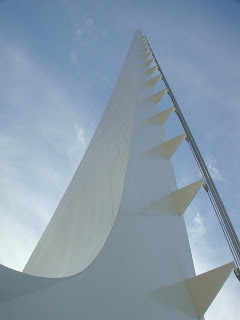 I'm happy to say although it was a bit unruly, especially when making the straps - I survived and would do it again! The teflon foot wasn't even needed, my machine did just fine with the usual. 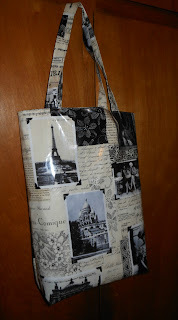 I chose this fabric because it's all about Paris and since it was a birthday gift for a friend who's been there and wants to go back - it seemed very fitting. Plus, she shops the farmers market and a wipe clean surface is the only way to go. Originally I thought I'd use two different contrasting fabrics so that when you reversed the tote you could actually tell. But the print is pretty unique and didn't play well with my other choices. 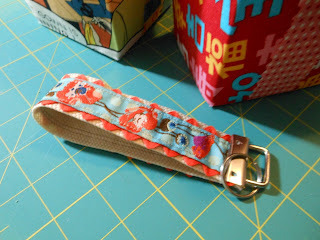 I didn't want to poke holes in it with pins and couldn't iron the folds of the strap, so I tried just rolling the strap as I sewed and there was a bit of twist that resulted. For the second attempt I found some office clips to help them stay put. The modification that I made on the size was to make it deeper so that a stalk of produce wouldn't stick out too much and the measurement for the bottom (step#3) was sewn at 2" instead of 1.5". What came in handy with that change was the easy to spot target of the #1 and #5 on the ruler to confirm the sides were even. We met for lunch and I presented her with the tote which she so sweetly said she liked it. I'm on a kick of making practical and useful hand-mades, how about you? 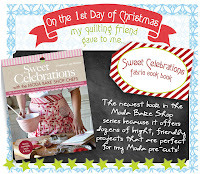 Our MQG will be using this tute for a Secret Swap with inspiration form the amazing group Mouthy Stitches flickr pool. 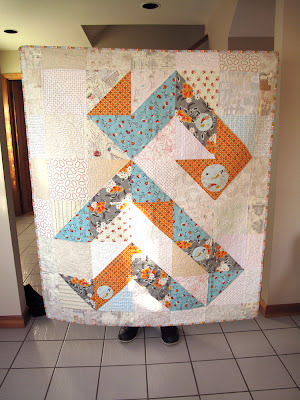 Linking up with Amanda Jean at Crazy Mom Quilts for Finish It Up Friday . 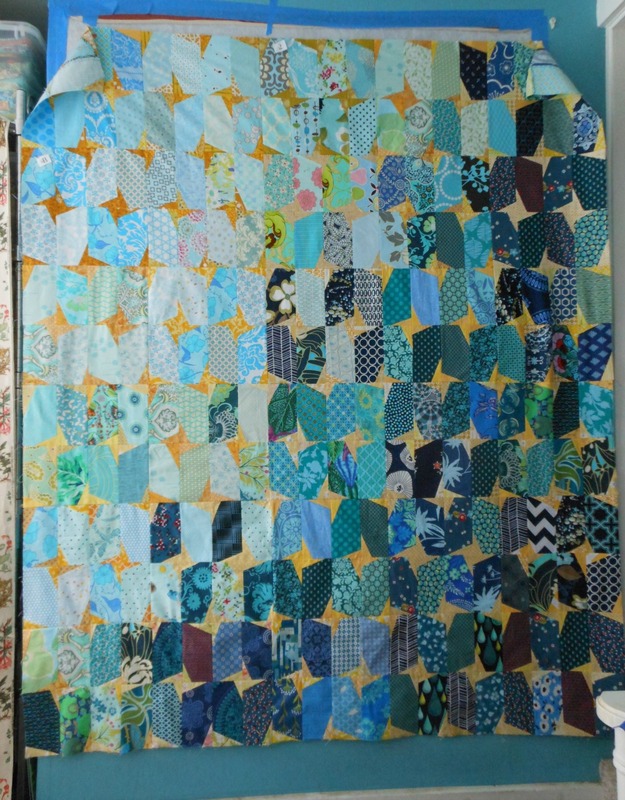 Check out her drano quilt with the wonderfully placed dark squares- (I love the backing choice she ended up with) and of course hop around the link ups. I work in fabric and thread, not paper and glue. A mosaic photo of fabric pictures seemed like a nice compromise. I'm just hooked on this book and Melody Miller - her style is so unique - I want it ALL. 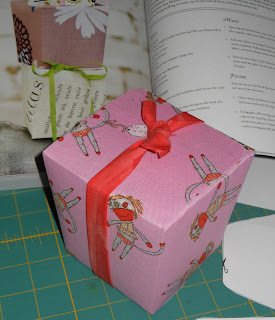 Ruby Star Wrapping makes me want to give, give, give just to have an excuse to make a container to put the gift in. Sew Mama Sew has announced a contest and I'm linking up my clever tin - wish me luck. 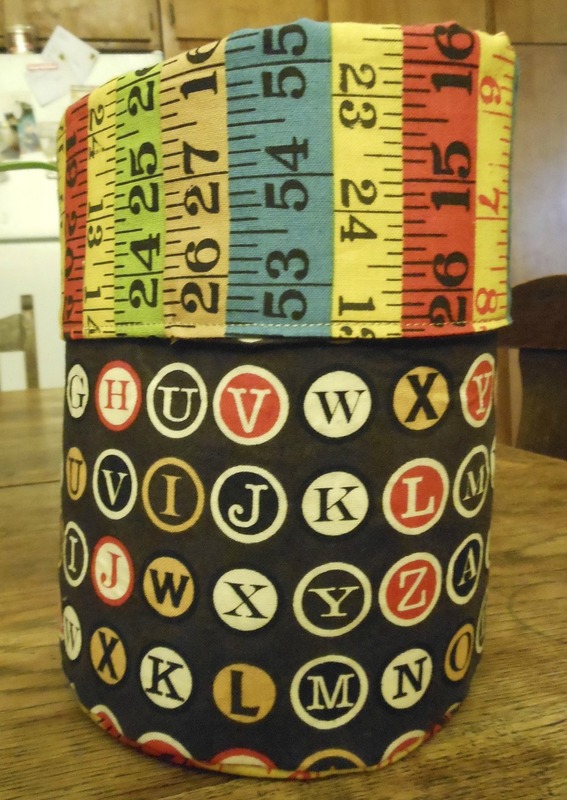 When I saw the photo on page 28 with a suggestion to try using an oatmeal or coffee tin rather than a box I knew just what to do. The 10 inch tall canister I had saved from my hubby's bottle of scotch had found a purpose. The other item that I'd held onto knowing it would HAVE to be crafted with rather than recycled was the Art Gallery Spring 2012 catalogue I was given at Sewing Summit - the wonderful magical event where I received my very own copy Ruby Star Wrapping. I'm a HUGE Art Gallery fan and enjoyed playing "name that fabric line" and "I spy something I own" - those little thumbnails are quite entertaining. 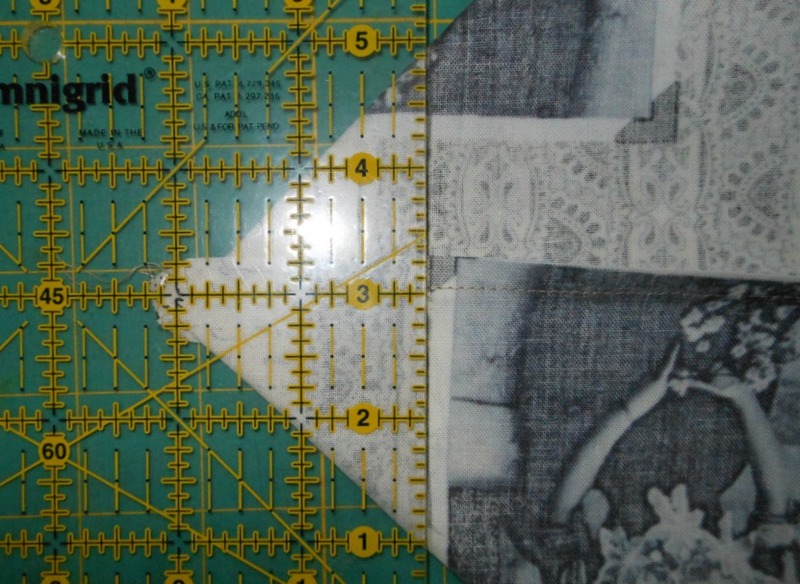 I used my rotary and ruler to cut the page (sorry blade) because it was too large for my paper cutter. 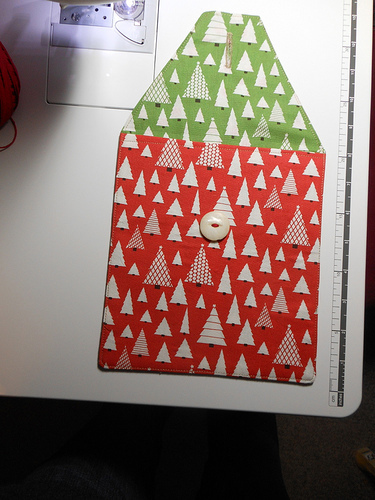 The width of the sheet didn't extend all the way around so I lined up and joined a part of the other page using the row as a guide. To be sure that it held I used glue stick and then tacky glue. Working with a curved surface presents its own challenges with paper - just like sewing curved pieces on the bias does, they're a bit unruly. Even the photo shoot was a bit awkward but here it is - pretty on all sides! This weeks blog hop takes us to Maureen Cracknell Handmade with an adorable button down shirt bag. I'm one of her regular followers so I didn't have to hop far. 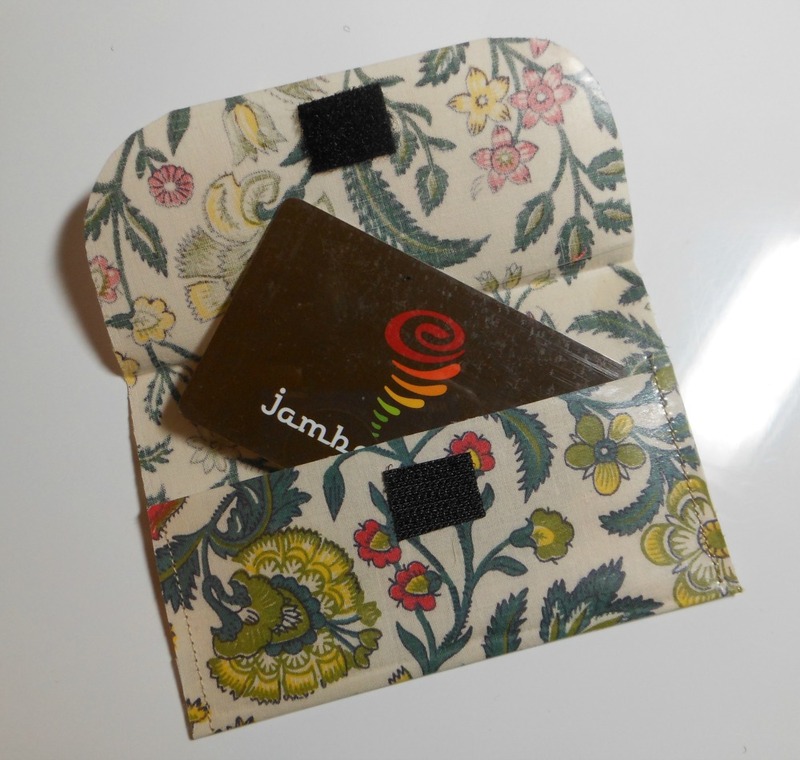 There is more to come this week with Sara of Sew Sweetness and the Pocketed Apron Wednesday and The Busy Bean with her Little Snack Packs Friday- that was a fun one to do, here's mine! linking up to Ruby Star Wrap along - thanks again guys for this fun series. There is always room in life for more firsts don't you think? I decided to link up to the Handmade with Love Tutorial contest at Pink Chalk Studio with my Tassels Quilt - just for fun to play along. Writing a tutorial is harder than I thought it would be back in March when I took it on - more power to those who do it often. It's fun to see the winners from last year and the entries for this. They will be announcing the top picks and opening up to viewer voting on Wednesday. I'm so so excited to participate in this challenge and to see what other members of the MQG are doing. Being part of the big picture means a lot to me and continues to connect my creative process across the globe which is pretty cool. I think these two Michael Miller Starfruit and Periwinkle from my stash play nicely and have an order of more Madrona Road arriving today so I can make a good sized quilt. Pretty sure the design in my head is the one I'm sticking to but until it's cut there always a chance I'll change my mind. 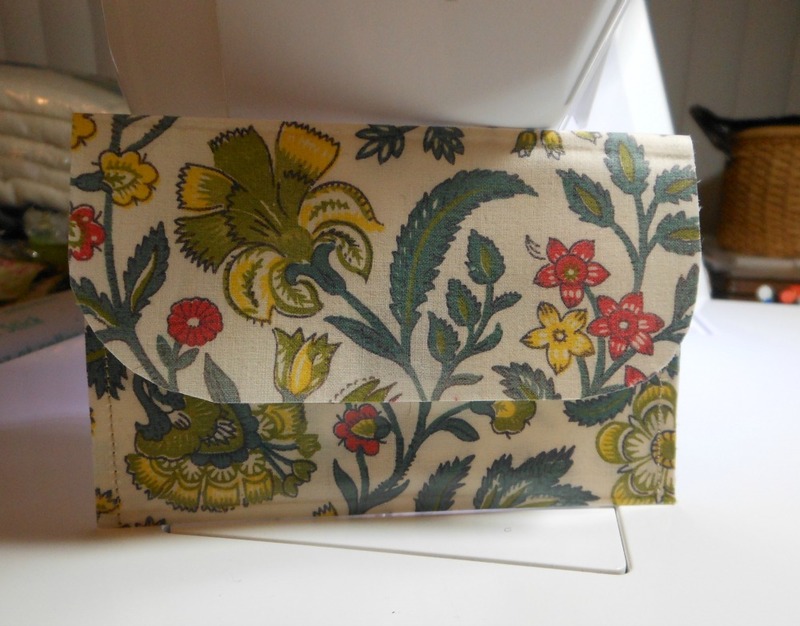 Fancy Fabric Envelope, a photo by capitolaquilter on Flickr. Getting myself in the Holiday Spirit with my latest Ruby Star Wrap Along - the Fancy Fabric Envelope. One of the top items to catch my eye when I got the book. I must say I needed more pictures than words for these instructions and ended up just kind of winging it. 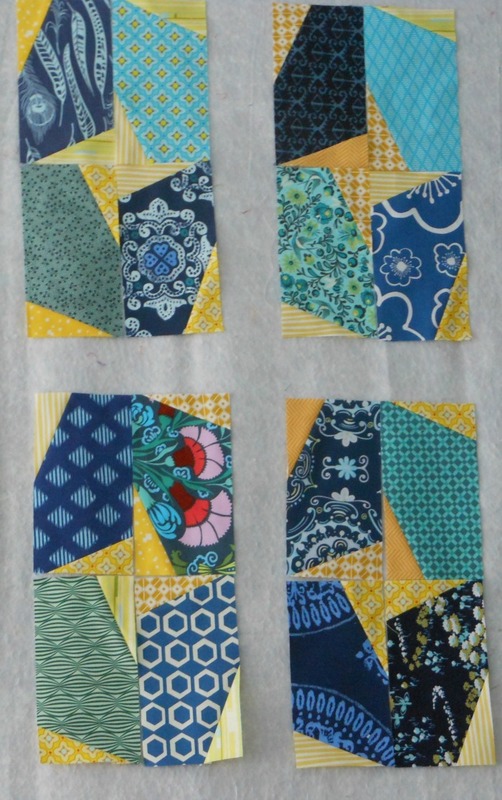 I had my cute fabric all picked out and wasn't going to keep quilt math from trying. 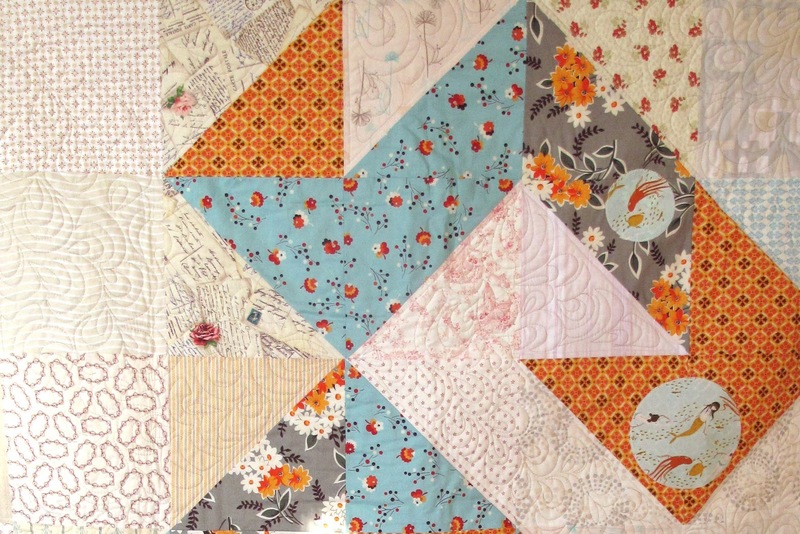 When I read Lee's math comment on Freshly Pieced about directional fabric for the back and that saved me from making the trees stand on their heads - I put them on the inside instead. These little Christmas trees may be the only ones in our house this year unless we get our act together! One of the things that has sparked excitement about the Holidays is reading and writing all of the comments on the Sew Mama Sew Giveaway. Many were about favorite traditions or special plans. It got me thinking. 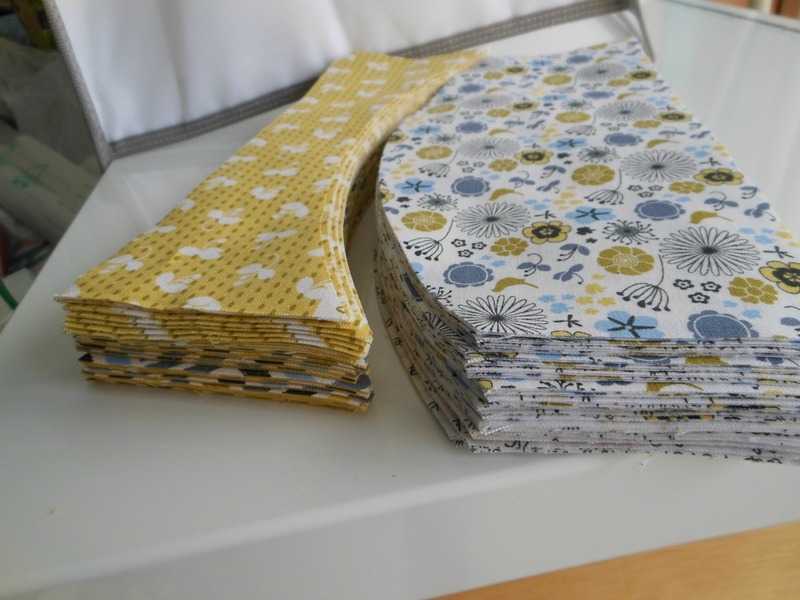 Lucky me, I won four fat quarters of Heather Ross's Far Far Away Three from Caila Made! Super Thrilled. I'm sure there are many many happy winners out there today - congrats to all and Thank You to participating bloggers. The wonderful Jennifer at Knotted Thread held a giveaway for those who made Sandy Help blocks and sent me the Notting Hill FQ bundle in Teal. I just had to get the Poppy color as well from her etsy shop. She's so quick and thoughtful. The Gift Certificate from Pink Chalk didn't burn a hole in my virtual pocket for long. I ordered some of the newly released Architexture by Carolyn Friedlander along with some other goodies while I was at it. Thank you Sukie and the Ruby Star Wrapping Along sponsors (linking up again this week) - you're just too good to me I should be the one wrapping up a present for you! Last month it was all about Sewing Summit and this month it's the SBAMQG Retreat where I did most of my work and a little bit since. It's been fun and productive with a few finishes for swaps, bees and charity with a dabbling of Ruby Wrap Along throughout. 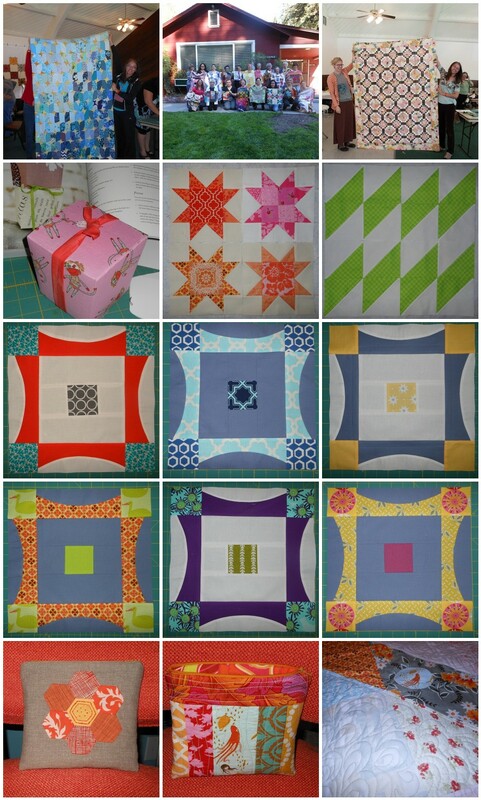 My November Line Up: Tassel Quilt top, MQG Retreat, Sisterly Love Quilt top, Take out Box, Stars for Nico F+F=AMS, Sandy Help blocks, 4x5 Bee Hive#7, Travelin' Pic Stitch hexi/Post Sewing Summit Swap zipper Pouch, FMF Charity Quilt. Ruby Star Wrapping flower bow. I'm also linking to Kati @ from the Blue Chair at End of the Hallway. My favorite project for the month of November is the QCR Curve it Up Churndash blocks for the 4x5 bee. I kept them on the design wall until the last minute to mail and totally want to make an entire quilt with the design. 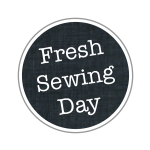 linking up to Fresh Sewing Day at Lily's Quilts. Be sure to check out the links on my post from Thursday and take a trip around the world with the Travelin' Pic Stitch Hop. Australia and Europe link ups are growing as well as Americas and there is much to see. 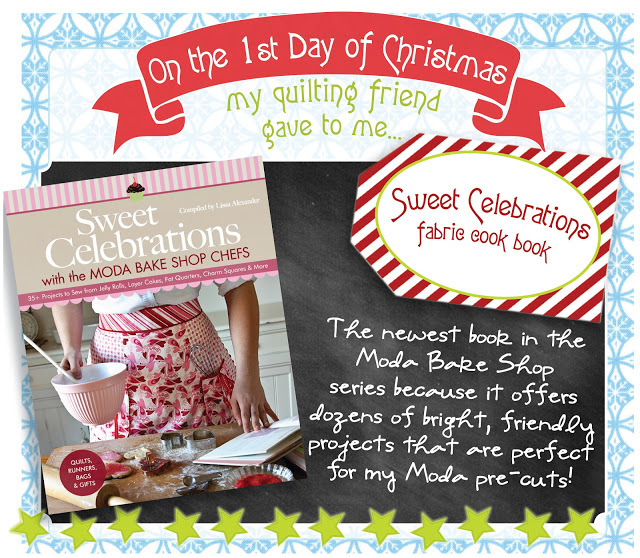 Today is day 1 of Moda's Cutting Table blog's 12 days of Christmas hop. Last year there were some cute gift ideas and tutorials. Sew Mama Sew also has a great Holiday resource on with Ultimate Handmade Holidays. And don't miss Giveaway Day tomorrow, I know I'll be busy checking it all out. Hope the home stretch of 2012 treats you well. Happy Quilting.